It’s time to continue exploring the non-canon adventures of the crew of the starship Enterprise. This is going to be fun, as some of these I haven’t read since I was a kid (reading them as they were published) and some I have never read. So going in order of publication, the first book to come out after the novelization of The Motion Picture, was this novel from 1981. Now, don’t let the cover fool you, with its new uniforms and Enterprise, this story takes place towards the end of the original five-year mission. The cover is correct in showing Sulu with a moustache and longer hair – this is the result of a standing bet with the new security chief, the fiery red-head Mandala Flynn. And despite being non-canon, it does introduce something that will become canon… Sulu’s first name, Hikaru. In fact Sulu gets a lot of attention with his own subplot, a blossoming romance with Flynn, his desire to one day command a starship as its captain, his promotion to Lt. Cmdr (the rank he holds at the start of TMP)and the thought of transferring off the Enterprise. The main plot follows what should be a milk run for the Enterprise crew. Kirk and company have been asked to transport a scientist, Dr. Mordreaux, across the system, to a rehabilitation complex, as he’s been found guilty of murder, and unethical behavior. However, tragedy strikes when despite being seen secured in his cabin, Mordreaux gets onto the bridge, and kills Captain James T. Kirk! 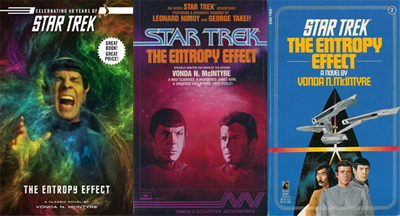 Mordreaux maintains his innocence, and it is up to one of his former students, Spock, to figure out what is truly going on, and how it ties in with his own studies of a spatial phenomena displaying heightened entropic effects. 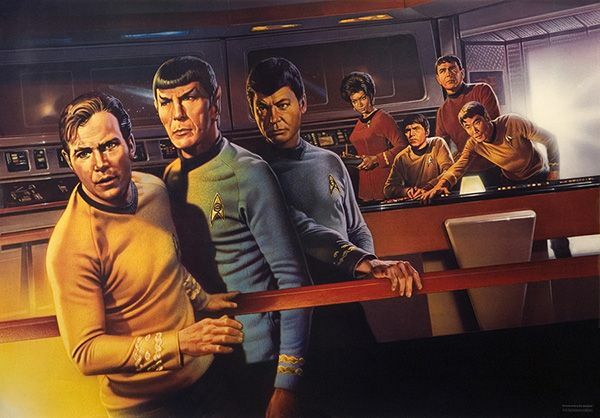 It seems Mordreaux is working with time travel, and certain changes, and the timelines that have sprung up from them are now on the verge of tearing the universe apart unless Spock can find a way to return things to normal, and hopefully save the life of his friend and captain. It’s not a bad novel by any means, and the timeline idea is fun, and handled nicely, but I’m not sure that McIntyre has a complete handle on the characters at this point. Some of the dialogue feels close, to not quite right, and some of it I just couldn’t imagine coming out of the characters’ mouths at all. Still, for the first novel in this incredibly long series of books (not a complaint), it is a solid entry into the universe, and does add some nice characterization to Sulu. I also think a lot of the stuff that feels like it doesn’t work is because the series didn’t have the history it now has, there’s a stronger understanding of the characters, and the stories in the books are now even more well thought out and planned in relation to events that have happened within that universe. It is, however, a great way to start the non-canon series!